Our planet is a creative force. It continually makes new things. It mixes and molds, formulates and blends. It's been doing this for billions of years. Some of these creations are sensuous, ever changing experiments of light, texture, sound and aroma. We and all "living" things around us are part of this ephemeral side of the earth’s creativity. A more permanent side to our planet's creativity it reserves for the composition of its essential form: rock. Through a unique combination of both its ephemeral and permanent sides we have Bluestone. Many eons ago our planet directed its sensual side to the earliest attempt at what was ultimately its greatest creation, the forest. This, like all youthful experiments, was flamboyant; volatile in composition. It was a forest with an explosive, fiery life cycle. Over millions of years this experiment continually blended the ashes of the forest's seasons with the rains of an atmosphere saturated in an acrid haze, eroding the scorched fragments of rock at its base to be deposited as sands in the depths of a broad sea. At the end of the forest experiment a dead land, no longer held by the forest's roots, washed down to cover these scorched sands. After tens-of-millions of years a two mile thick layer compressed the sands at the bottom of a deep sea. Heat from this pressure and the depths worked upon the sand’s scorched and crystalline elements, chemically merging them with properties of the limestone bed of the ancient sea. A copy of Alan McKnight’s beautifully descriptive graphic of the geological base of the Town of Saugerties from a 1985 article written by Spider Barbour on the Geology of the Catskills. The result became the massive, 500 foot-thick monolithic plate of dense dark sandstone we know as Bluestone. The process yielding its organic bonding and color involving intense pressure from both above and below following the period of its formation during the earliest in the evolution of forests make Bluestone a product of nature that is incomparable and in a way mysterious. Over the next hundreds of millions of years this plate was lifted from the depths under the drifting action of the Appalachian and Acadian land masses. Unable to push this Bluestone plate and its two-mile thick burden forward, they pressed under instead, eventually forcing this land mass three miles high at its eastern front. Over millions of years of exposure this mountain eroded west to make the continental plateau and east down the Hudson River. west side of the Hudson Valley. made as the weight of the mountain was released. These are the Bluestone ledges of Saugerties. After the most recent hundred thousand years of this ledge sculpting man appeared, at first hunting the animals that sheltered beneath the broad overhangs of the Bluestone ledges. Over a hundred or more generations man settled in to cultivate the rich soil of a sweeping savannah deposited in a valley by runoff from the ledges high above. In his long union with these ledges man developed a spiritual connection with their plated structure. They represented a symbol of the Earth which he likened to the form of the shell of the turtle. He lived in harmony with this symbol. He was a life this turtle bore on its back. The other life forms there were what the earth gave him to fill his needs. He moved not one stone from these ageless ledges lest that harmony be disturbed. Four hundred years ago Henry Hudson met these native peoples and in recording the resources he found on their lands wrote of the "great store of slate for houses, and other good stones". Within a score of years stone houses began to be built by the Dutch settlers from "cliff stone", the dimensional fragments fallen to the base of the ledges, and at the same time the native people, the Warranawonkongs, disappeared. For nearly two centuries "found" stone was the principal building material for the hundreds of stone houses that line the flat farmlands that spread out at the base of the Bluestone ledges. The earliest stone houses were made of "cliff stone". Chunks that weathered from ridges of limestone and sandstone were plentiful and could nearly always be found in a form dimensionally ready for building. The outcroppings of bedrock at these ridges had been deeply stressed in a nearly prefect north-south direction. The weathered edges crumbled as flat slabs that accumulating at their bases. Picking through these naturally found flat stones would lead to the founding of an industry for quarrying and finishing perfectly dimensioned stone slabs. This began in 1831 when Silas Brainard was hired to build a bridge in the newly incorporated Village of Ulster, now Saugerties Village. The Woodstock and Saugerties turnpike was being constructed at this time and he discovered that above Veteran where the turnpike zigzagged its way up the Hoogeberg ridge there was readily accessible the quality of stone he needed for building the bank abutments to support his bridge. A house on the vanValkenberg farm was constructed of perfectly dimensioned blue sandstone. The ledge that supplied this stone became the site of the first commercial Bluestone quarry. Within 30 years the quarrying industry had grown to involve over half the land mass of Saugerties. So the History of Saugerties can be traced in its stone: that of its settlement phase in the walls of its stone houses; that of its industrial phase in its quarries; that of its ancient past in its much-changed landform. Before modern man arrived only the earth had the power to change this landform. For thousands of years the native inhabitants of the Saugerties region tightly stacked their burial cairns of its stone only to ritually remove it and return it to its natural place once the body inside had been returned to the earth. They were an integral part of this land and they left no permanent marker on it. The Europeans that replaced them had the opposite use for stone. It raised them above the earth and allowed them a sense of permanence. The permanence of their stone houses made these “landmarks” and they remain period markers of Saugerties' early recorded history. This history follows the land. The first stone houses set their foundations into bedrock ledges and raised their walls to match the slope. These are bank houses. They were located over a spring of water that the house enclosed for winter use. They were the houses of herdsmen as the pastureland of the earliest settlement, Kingston, spread northward. Stone houses were also built along the major wagon roads and by-ways. These are different. They are built on the ground plain and made large enough to act as way-stations and frontier garrisons as well as shelters for the farming family they housed. The period of greatest activity in stone house building in Saugerties follows the competitive growth of agriculture. This coincided with the disbursement of the largest immigration of the time, the West Camp Palatines, after 1712. Prior to their homesteads most of Saugerties was frontier. Before and after the Revolution their stone houses showcased the growing prosperity of remote farms well into the interior. The longevity of the stone landmarks of Saugerties and their characteristics of placement and appearance help to date individual farmsteads and whole settlement regions. This in turn helps to link a particular place to a recorded event. By knowing where our stone houses and quarries are located the progression of history can be experienced. The "stone dwelling house" named in the 1834 deed from William VanValkenberg, its builder, to Silas Brainard, the bridge builder who is historically credited with operating the first commercial bluestone quarry, is a perfect example. This is a house crafted of stone extracted from a nearby ledge rather than from stone found at its base. Its survival shows that bluestone was quarried to take advantage of its working properties before it became a commodity for a market that the naturally formed 2" thick rifts in its structure were uniquely suited for: sidewalk stones. By the 1870's thousands of miles of sidewalks in nearly every large city in America had been covered with "slate" quarried from every exposure of Bluestone ledge that could be found along the eastern escarpment of the Catskill Mountains. This was known as North River Bluestone after its shipping location on the North (Hudson) River. Silas Brainard's initial quarry in 1831 began a change in the geography of Saugerties resulting entirely from the hard labor of individual men. These are the men that, with great pride, called themselves “Bluestone Men”. They inaugurated a tradition of skill that would spread throughout the Catskill foothills and would last for well over a century. In slices of an inch-and-a-half they peeled their way through the solid rock hill of this first quarry, changing the course of streams from south to north, making a wide pass between the Plattekill and the Beaverkill that would be known as Russell's Clove. They had begun an equal change to the north through the productive headwater feeders of the Beaverkill when Quarryville opened their attention to its even more productive seams. Bluestone quarrying was an early form of the 1849 gold rush. Shanty towns sprang up around the quarry sites mostly occupied by Irish workers already skilled in hard rock mining as laborers on the Erie Canal. They would later use their skills in the iron mines of Minnesota, the silver mines of Colorado and the gold mines of California but they would make their first small fortune in Saugerties. These were the skilled workers that made Bluestone quarrying into an industry. Large fortunes were made from Bluestone before and after the Civil War. The largest were made in Saugerties. Its quarries were closest to the river ports with their finishing yards and merchants. Transporting a slab to the docks may cost only 8% of its value in Saugerties as opposed to as much as 30% if the quarry were in the hills of Hurley or Woodstock. This transportation created fortunes for the owners of the toll roads to Glasco, Malden and Saugerties Village over which a steady, almost non-stop train of "Bluestone Boats" passed each other to and from the docks. These roads were specially improved to carry the great weight of the Bluestone. Grooved rails called Belgian Bridges were laid the length of the turnpikes to prevent the wheels from sinking deep into the roadbed under the heavy loads. Not all the quarried stone went to the Bluestone docks. Some of the larger pieces from the quarries that were unmarketable as slabs were dressed for building the many cut stone houses, outbuildings and walls that are found in the areas where the first quarries were started. Cut stone houses are found near the quarries in Pine Grove, Veteran, above Fishcreek on Old Echo Hill Road and in High Woods both north and south of the Glasco Turnpike. These date from the very earliest stage of quarry development. They testify to the skill of the stone cutters at the quarries and the value placed by the owners on the quarries themselves by their building these estate houses of the period so near to their quarrying operations. The largest by far estate house built entirely of cut bluestone is the mansion house of James O. Winston, the engineer of the dams at the great Ashokan Reservoir. This is situated less than a mile from where the first bluestone quarrying began in 1831. The property on which the house is built was bought after the completion of the Ashokan project in 1914 and the mansion house was probably completed after 1921 as a final enlargement to an ancient stone house occupying this site for over a hundred years. Winston's house is a monument to a man that may have been the very last of the great quarry operators. The Yale Quarry at the Ashokan Reservoir encompassed an original 4 acres and adjacent lands just to the southwest of the great dam being built over the Esopus. From the day the project began in 1907 to the last with the building of the great fountain aerators and the administration buildings in 1914, Winston & Company continually extracted and dressed bluestone from the Yale Quarry. Some of the last Bluestone commercially quarried in Saugerties was from the York quarry in the 1930’s and used for the facing stone and the columns of Rockefeller Center. This was done during the depression when the National Youth Administration also attempted to promote the learning of quarrying skills and building and carving with stone. Some related WPA projects such as Bluestone arch bridges, roadside retaining walls and the NYA buildings that became those of the Art Students League in Woodstock were the last major applications of Bluestone. After the hundred plus years since the earliest of the quarries went inactive what remains most dominant as evidence of this era are the large mounds of “quarry rubble” forming the most highly recognizable landscape element of Saugerties. Over the course of a century the quarries of Saugerties cut into thousands of acres of bluestone ledges removing as much as a hundred feet of surface from each. 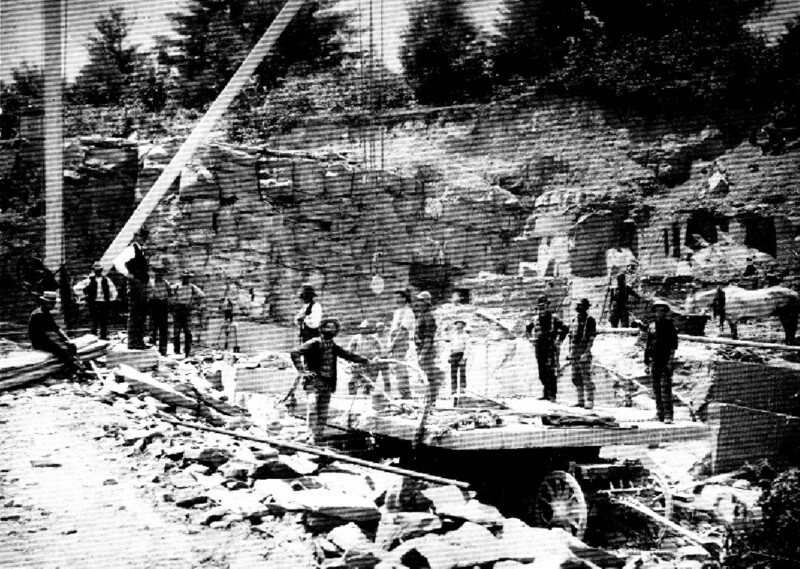 By mid-20th century, when Bluestone quarrying had ceased to be an industry, it had left hundreds of thousands, perhaps millions of tons and hundreds of millions of pieces of this quarry rubble stacked in piles along the roadways of Saugerties. Along with the abandoned quarry pits that are fixtures of Saugerties’ back woods with their angular cuts and smooth surfaces, their clean edged depressions here and there filling with pools of water, Bluestone has left a lasting impression on Saugerties. This has had an economic impact. None of the acreage of the abandoned Bluestone quarries so deeply cut into the bedrock can be made to satisfy the drainage requirements of the health code for building a residence. Since this is currently the principal means of valuing land in the Town thousands of rural acres are removed from being economically productive. This essentially guarantees that Saugerties must retain these quarried lands as open spaces for ages to come. These lands still have important uses. They have cultural value in their industrial archaeology significance. They are also a window into the history of the planet for the study of geology because they form a slice into the millions of years it took to accumulate the hundreds of feet of sediment forming the material eventually compressed into the monolithic 500 foot thick Bluestone plate upon which most of the east continental plateau of the United States resides. 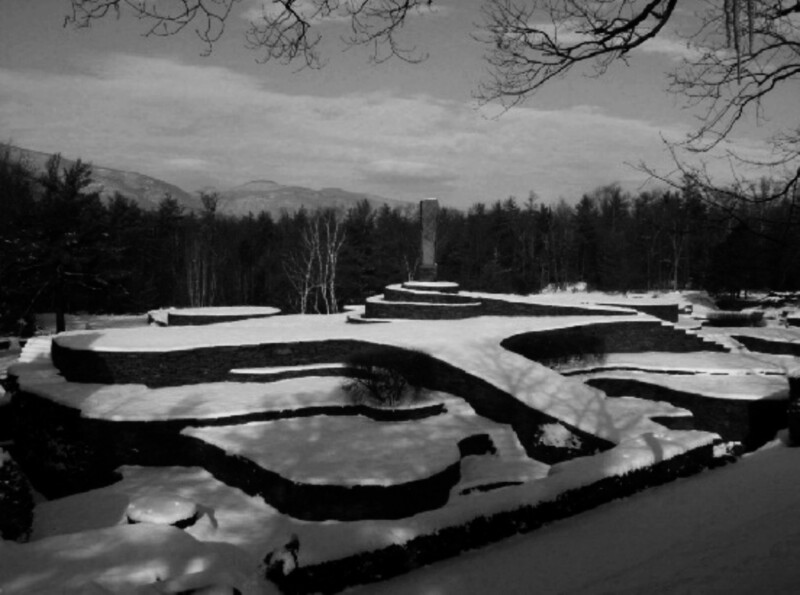 But the use that can realize the highest economic impact for Saugerties follows the example of Opus 40, the environmental sculpture of Harvey Fite. As sites for sculptural works a whole new dimension is brought to the useful development of these abandoned quarries and the landscape of Saugerties. With art Bluestone can continue to be the once and future soul of Saugerties. Bluestone quarrying began on the weathered back slopes of the Hoogebergs. It is on this exposure where the hardest and best bluestone is found and where the quarries were most productive. This strata stretched south to where the Catskills turned southwest down the Rondout Valley and north to where they turned northwest up the Schoharie Valley. As the Bluestone ledges progress higher and up into the Catskill escarpment the upper levels of the strata are found. The upper levels of Bluestone are interlaced with transitional materials such as limestone conglomerates and mudrocks underlying the predominant red shale of the Catskill Mountains. This lack of uniformity of the higher Bluestone seams makes them less productive. 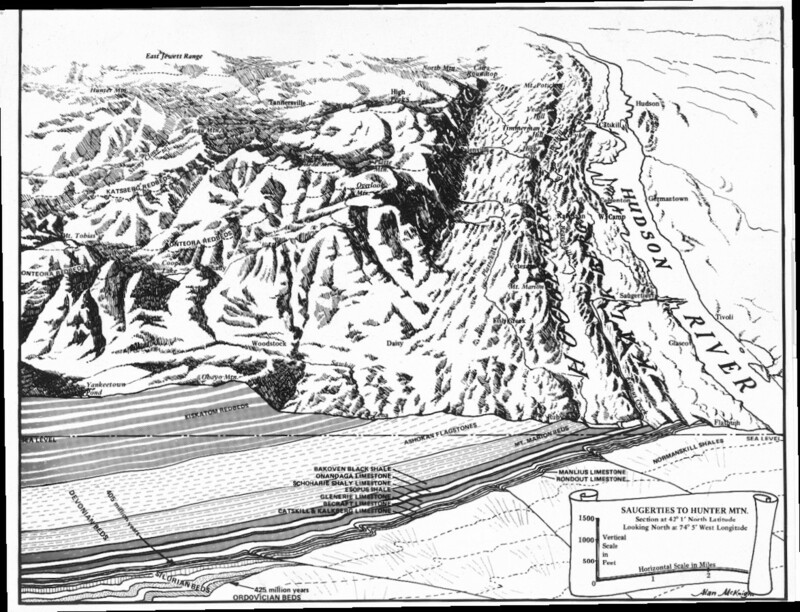 The seams of this upper strata have supported Bluestone quarries as far west as Lake Erie, along the north paralleling the Mohawk Valley and as far south as northern Virginia where the dipping slope of the formation to the west allowed erosion to expose its most upper level. Seams of high quality mid-strata Bluestone comparable to those found at Saugerties were quarried at the base of the Catskills in Sullivan, Delaware and Broome Counties where they had been exposed by glaciation along the upper branches of the Delaware River. A seemingly unending number of outcroppings ready to be quarried covered the landscape of Saugerties. One graced nearly every farmstead. The massive five hundred foot thick strata of Bluestone surfaces at its eastern-most extreme at Saugerties atop the escarpment of the Hoogebergs, a chain of hills midway between the Hudson River and the base of the Catskill mountains. The Hoogebergs define the landscape of the eastern half of Saugerties. These hills are the exposed front face of the Mount Marion Sandstone Formation of mid-Devonian fossil-rich shales. From the top edge of the Hoogebergs this formation plunges 500 feet down in a nearly vertical angle, half of this height deep into a sunken valley. The weight of the Catskills has bent the Mount Marian formation at the base of this valley enough to have squeezed the layers of underlying limestone up on edge, exposing them as the ridges that separate the Hoogebergs from the Hudson River. The dissolving of the limestone base of this sunken valley has made it into one large aquifer. Immediately above the Mount Marion Sandstone Formation is the base of the Ashokan Flagstone Formation: Bluestone. This strata is also bent upward by the weight of the Catskills. The exposed ledges of Saugerties are the eastern edge of this immense monolithic platform of Bluestone. It is so strong that it remained intact while lifting a mile and a half layer of sandstone above it two miles up on its back to form the continental plateau. The leading edge of this uplift has since weathered down to be the Catskill Mountains with the shallower slope of the western part eroded toward the Ohio River into what is called the Catskill Delta. 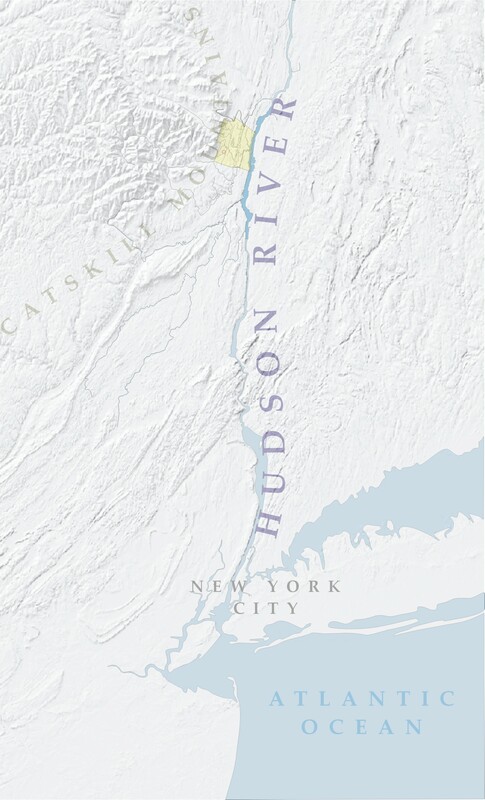 The steeply eroded escarpment to the east defines the Hudson Valley. The lowest and most dense exposed level of the Bluestone plate is found closest to the Hoogberg ridge. The rest of the total 500 foot original thickness of the Bluestone strata is exposed at various ledge lines stepping their way to the 700 foot level up the steep wall of the Catskill escarpment. These many exposed ledges between the Hoogebergs and the base of the Catskills follow a path effected by weathering, the formation of the Hudson and glacial stripping that has taken place over the past 75 million years. These rugged Bluestone ledges define the western half of the landscape of Saugerties. Bluestone is a unique material. The quality of its composition made it highly valuable. Its compactness and the fineness of its surface make it resistant to water and wear. These qualities were in great demand for sidewalks in all the growing cities of the Americas throughout the nineteenth century. Materially and economically Bluestone is historically the foundation of Saugerties. The structure of the bedrock made it easy to quarry and the locations of the quarries in Saugerties made it easy to transport to market. Bluestone’s naturally-occuring even seams of five to seven foot widths permitted the stone to be split into nearly square, smooth-surfaced inch-and-a-half to two inch thick slabs. Slabs of this thickness and dimension were highly marketable as paving stones. Bluestone quarrying brought a new value to the land and a new source of income to the community. The quarrying of Bluestone follows a process distinct to its unique form and structure. Glaciation left the exposed ledges of Bluestone lying like fanned cards where the spaces in-between the edges filled with soil and captured water. Bluestone quarries were developed where bedrock was uncovered in this land between the ledges. The surface of the Bluestone there had been kept wet by the water under the covering of soil and this dampness prevented the natural cross seams or "headers" that formed where the bedrock was exposed. These quarries allowed larger, more valuable lifts to be productively taken because the size of the lift could be governed by drilling holes where a break was desired instead of being limited by natural-formed divisions. In the Saugerties area the Bluestone divides naturally into seams, or rifts, that follow a nearly true north-south direction. They occur between five and seven feet apart. A quarry often was started a dozen or more rifts from the exposed surface of the stone at the edge of a ledge to avoid the naturally formed headers. The area to be quarried was cleared of its cover by blasting it away in the winter when its frozen overburden could be easily scraped from the smooth, flat bed of Bluestone below. Bluestone was quarried as "flagstone" to be used for sidewalks. It was quarried as "edge stone" to be used for curbstones or window sills and headers. And it was quarried as "rock", removed in massive four inch to four foot thicknesses to be later cut to order as building stone, door steps and porch platforms. Quarries generated immense amounts of scrap stone called rubble. The chipped stone removed from the leading edge of a ledge to reach a speculative seam was dumped into large stacks a distance from the developing quarry over an unproductive part of the site. Waste was also accumulated in stacks as seams were exposed by blasting the frozen overburden. The material from the first broken cuts made to form the header for starting the quarry was also gathered into stacks. The larger quarries created entire shifts in the landscape as the rubble became hills or filled valleys. Most of the productive quarry sites in Saugerties were early purchased or leased by the wealthy merchants of the time; Jeremiah Russell, John Maxwell and Asa Bigelow. These were generally leased back to quarrymen for 5% of the value of the Bluestone they quarried. However, some dealers, such as John Maxwell, ran payrolls of up to $3,000 weekly employing as many as 800 between the quarries and the finishing mills. At its peak John Maxwell had a large fleet of sloops, schooners and steamers feeding his company wholesale yards in Rochester, Newark and Philadelphia. The earliest quarrymen cut and finished their stone goods and carted them to the merchants ready for market. Later quarrymen transported their Bluestone to the docks for finishing. This was because of a combination of factors. The first was that they were being paid by weight but it is likely that many of the earlier skills had been lost after every farm and homestead began to mine their acreage for Bluestone. This latter development lead to the vast number of rubble mounds and "prospecting pits" found in the area of higher elevations. Most were unsuitable sites producing nothing but unmarketable stone fragments but the number of quarrymen that were working these many sites made each a competitor for a sale at the dock. This rush to the dock simply did not allow time for finishing the stone. Toward the end of the quarrying era a quarryman working nine months a year was making around $300 annually delivering curbstone and slabs to the docks at about $2 per ton. When a skilled carpenter was making $2.50 a day the average of three deliveries a week with an eight ton wagon by comparison made quarrying a well-paying occupation for the time. There is yet another valuable aspect to what remains of the Bluestone quarrying legacy of Saugerties. In the 1940s the sculptor Harvey Fite began a sculptural environment, "Opus 40", made of the remnants of an abandoned quarry, essentially organizing the clutter of the rubble left by it into an aesthetic form. Harvey Fite was a traditional sculptor who had his studio near the York quarry in Saugerties. Like many other local artists of the time he carved statuary out of Bluestone and used the grounds around his studio as a setting to display his sculptures. He had been building pedestals of stacked Bluestone rubble that he found in the abandoned quarry adjacent to his studio and at some point in time these pedestals switched from their purpose of presenting his carved sculptures into the form of an artistic environment in its own right. This Earth Art sculpture, Opus 40, is the first known use of stone to structure the creation of an aesthetic environment solely focused on itself and not augmenting or sharing its purpose to a garden or to another functional use. The spirit of the Bluestone Men of Saugerties lives on through Opus 40. In images of Harvey Fite there is rarely the artist standing with his work. There is the worker lifting or hoisting the Bluestone into place; sharing the stage with the Bluestone and the sweat and passion of the ages of Bluestone Men that wrested from the earth decades before him the material of his artwork. Fite took this connection seriously. He collected the tools and the everyday articles of period life of the quarrying era and displayed these in a building he made just for them he called his "quarryman's museum". These activities of Harvey Fite, and his Opus 40, have, by example, placed a value on the quarries of Saugerties. Each abandoned quarry has a productive use. That is: to find a match with an artist who can see in its scattered rubble the makings of a creative work that can express a spirit as ageless as the Bluestone itself. This is the future of Bluestone in Saugerties.